In a year of record closures, two more abortion clinics have gone out of business. These two closures bring the tally of out-of-business abortion businesses to 44 so far this year. Operation Rescue has confirmed that an abortionist who wore a butcher’s apron while injuring a woman during an abortion has closed his Cleveland, Ohio, abortion clinic and is moving out of state. Meanwhile, a Livingston, Montana, abortion clinic has announced its closure as of October 1, 2013, due to the impending retirement of long-time abortionist Susan Wicklund. Martin Ruddock, 77, shuttered his Cleveland Center for Women’s Health abortion clinic last week. Ruddock told a covert Operation Rescue investigator that he “couldn’t” continue to do abortions in Ohio and that he would be “helping women” in another state. Ruddock did not elaborate further. It is possible that Ruddock could not comply with the hospital transfer agreement requirement that is required for abortionists in Ohio and could be taking employment elsewhere. 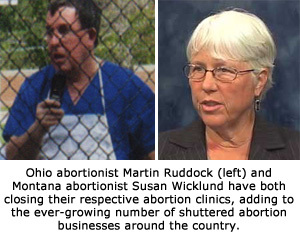 In 2006, Ruddock was forced to temporarily close after Ohio Department of Health inspectors discovered that the clinic was not meeting even the most rudimentary of medical standards, such as taking a patient’s temperature and blood pressure before risky late-term abortion surgeries. In September 2012, Ruddock appeared outside his abortion clinic during a medical emergency wearing what appeared to be a butcher’s apron. He was overseeing the transfer from his abortion clinic to an awaiting ambulance of a 26-year old second-trimester abortion patient suffering from a high fever and disorientation. Five weeks later, an ambulance transported a 30-year old woman suffering lacerations and heavy bleeding after Ruddock botched her abortion at 22 weeks. Records of a 911 call obtained through open records requests indicated she was “bleeding bad” and passing large blood clots larger than a 50 cent piece. In Livingston, Montana, the Mountain Country Women’s Clinic has halted all abortions and announced that it will be closing after only four years in business so that its abortionist-owner, Susan Wicklund, can “focus her attention on her health and her family.” Wicklund, 58, has been committing abortions for 26 years and has maintained a high public profile in support of abortion, even publishing a book about her experiences as an abortionist. Mountain Country Women’s Clinic and Ohio’s Center for Women’s Health are the latest to join the unprecedented and ever-growing list abortion clinic closures across America this year. • A declining abortion rate. • Retirement of aging abortionists. • Greater incidents of documentation and reporting of abortion abuses by pro-life activists.